Global superstar, Grammy Award®-winner and multi-platinum selling artist, Rihanna, announced THE ANTI WORLD TOUR. The tour, produced by Live Nation, will kick off in North America on Friday, Feb. 26, 2016 at Viejas Arena in San Diego, CA with nearly 40 shows lined up in New York City, Los Angeles, Toronto, Chicago, Vancouver, Washington DC and more. Samsung is the presenting partner on the North American leg of the tour, while PUMA is a supporting partner. Travis Scott will be the special guest on North American dates. The European leg of the tour will then follow with dates set up in London, Amsterdam, Berlin, Milan, Vienna and more. The Weeknd and Big Sean will be featured as special guests on all European dates. Tickets for all North American and European dates go on sale on Thursday, Dec. 3 at www.livenation.com. A full list of ANTI WORLD TOUR dates is below. 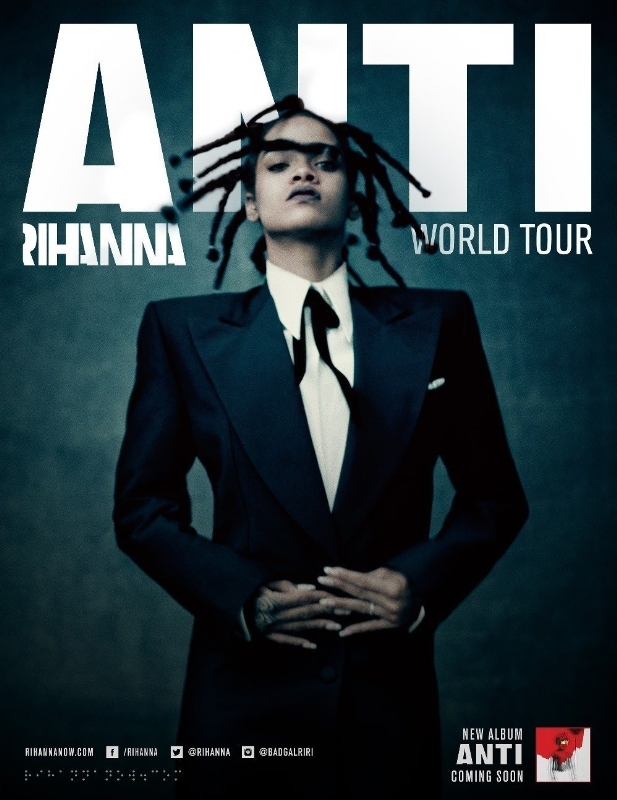 American Express® Card Members can purchase North American ANTI WORLD TOUR tickets before the general public beginning Monday, Nov. 30 at 10:00 a.m. local time through Wednesday, Dec. 2 at 10 p.m. local time. Be sure to download the American Express UNSTAGED App to purchase your Rihanna American Express® Presale tickets on the go, watch exclusive content from other top artists and learn more about upcoming music events.